The subscriber's war between two music video YouTube channels, the Indian company T-series and Swedish company PewDiePie finally come to an end. Currently, T-series has 92,112,530 Subscribers and PieDiePie has 92,084,801 subscribers and its still growing. Overall T-Series is one of the biggest Bollywood production of INDIA. It uploads music videos. The channel has over 92 million subscribers as of 31 March 2019, and is currently the most subscribed channel on YouTube. Whereas PewDiePie YouTube channel is running by one person name Felix Kjellberg. He is a Swedish YouTuber who makes comedy videos and has previously made Let's Play videos. His channel had the most subscribers from 2013 until 27 March 2019. In the six months, PewDiePie hits 70.0 million subscribers and T-Series gets around 85.4 million. T-Series joined YouTube in March 2006. Kjellberg joined in April 2010. T-Series has published 12,600 videos; Kjellberg has posted 3,600. Indian YouTube market is biggest, and about 80 percent of the country internet population using YouTube each month. But at last Kjellberg has challenged back to T-series and YouTuber's are near to reach 100M subscriber's. 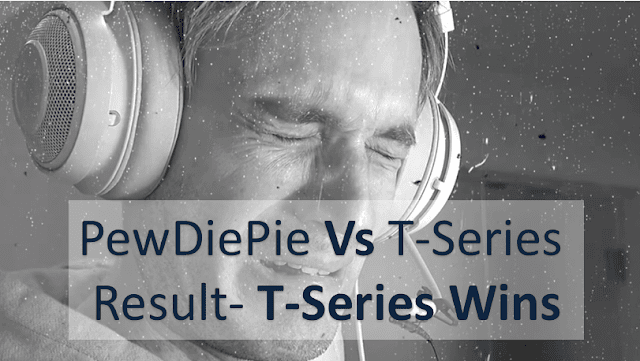 T-series tweeted and confirms the win.